Many people capture the cold water from the sink or the shower while they’re waiting for it to heat up, which is great, but you can also capture water while you shower. You just need a few buckets and you can capture several gallons of water every time you shower. This may not sound like much, but in our continued drought, a few gallons go a long way. 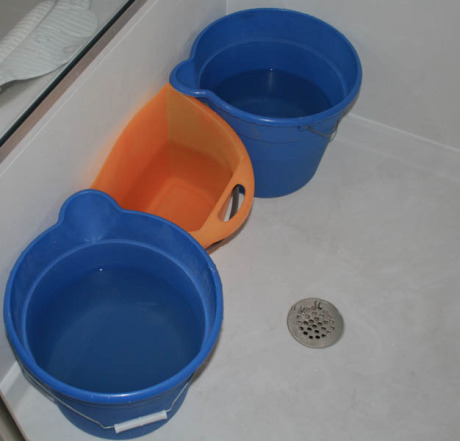 In my shower, I use two round buckets, but the real key is the flat-sided bucket that I put between them. I can press the flat bucket up against the back of the shower and catch all of the water that misses me and bounces off the wall. I catch about four gallons per shower, which I normally use on my oak trees in the front yard. A friend recently asked about soap in the water and whether that would hurt my plants. Well, most of the water that gets into my buckets has totally missed me, and so doesn’t have any soap in it. But even if the water WAS soapy, it wouldn’t hurt anything. The concentration of soap would not be that high, and soaps these days no longer contain phosphates, which used to be a problem.